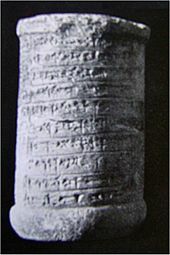 A clay cylinder inscribed with a description in three languages, as used in Ennigaldi's museum to accompany an ancient artifact; these are the earliest known "museum labels". Ennigaldi-Nanna's museum is thought to be the first museum by some historians, although this is speculative. It dates to circa 530 BCE. The curator was Princess Ennigaldi, the daughter of Nabonidus, the last king of the Neo-Babylonian Empire. 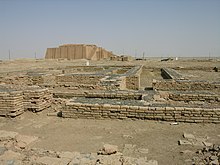 It was located in the state of Ur, located in the modern-day Dhi Qar Governorate of Iraq, roughly 150 metres (490 ft) southeast of the famous Ziggurat of Ur. When archaeologists excavated certain parts of the palace and temple complex at Ur they determined that the dozens of artifacts, neatly arranged side by side, whose ages varied by centuries, were actually museum pieces - since they came with what was finally determined to be "museum labels". These consisted of clay cylinder drums with labels in three different languages. Ennigalbi's father Nabonidus, an antiquarian and antique restorer, taught her to appreciate ancient artifacts. Her father is known as the first serious archeologist and influenced Ennigaldi to create her educational antiquity museum. The palace grounds that included the museum were at the ancient building referred to as E-Gig-Par, which also had her living quarters. The palace grounds also included the palace subsidiary buildings. When archaeologist Leonard Woolley excavated the ruins of the museum, its contents were discovered to be labeled, using tablets and clay drums. Many of the artifacts had been originally excavated by Nabonidus, Ennigald's father, and were from the 20th century BCE. Some artifacts had been collected previously by Nebuchadnezzar. Some are thought to have been excavated by Ennigald herself. The items were many centuries old already in Ennigald's time and came from the southern regions of Mesopotamia. Ennigald stored the artifacts in a temple next to the palace where she lived. She used the museum pieces to explain the history of the area and to interpret material aspects of her dynasty's heritage. The "museum labels" (the oldest such known to historians) for the items found in the museum were clay cylinders with descriptive text in three different languages. A kudurru, Kassite boundary marker (carved with a snake and emblems of various gods). A clay cone that had been part of a building at Larsa. ^ a b Anzovin, item # 1824, p. 69 The first museum known to historians (circa 530 BCE) was that of Ennigaldi-Nanna, the daughter of Nabu-na'id (Nabonidus), the last king to Babylonia. ^ a b Casey, p. "Public Museum" Around 530 B.C.E. in Ur, an educational museum containing a collection of labeled antiquities was founded by Ennigaldi-Nanna the, daughter of Nabonidus, the last king of Babylonia. 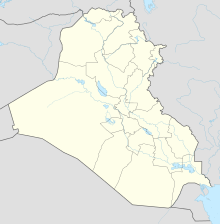 ^ a b c d Harvey, p. 20 Princess Ennigaldi-Nanna, collected antiques from the southern regions of Mesopotamia, which she stored in a temple at Ur – the first known museum in the world. This page was last edited on 10 April 2019, at 16:53 (UTC).